Viewed as a major investment for Coeclerici Group, Korchakol had the logistics in place to ensure easy transportation of raw materials to the port of Murmansk, where the company is well established; it also formed part of the group’s corporate strategy to promote enhanced upstream integration in purchasing coal from Russia. Organized as a parent company with four divisions: mining, trading, logistics and shipping, Coeclerici has created an integrated and flexible structure that guarantees efficiency, security and quality for organizations with complex procurement requirements. The synergies between these four divisions have developed over the last century to ensure the best possible results as close checks can be made at every single stage of the procurement process. Committed to evolving with the demands of the market, the group strengthens its logistics division service offering by establishing strategic international relationships with major coal producers, such as PT Berau Coal, the fifth-largest coal producer in Indonesia and international partnership with local companies. The four Floating Transfer Stations (Bulk Java, Bulk Borneo, Bulk Sumatra, Bulk Celebes) were designed to the specific needs of PT Berau Coal right from the drawing board and are being used to conduct offshore coal transloading operations at Muara Pantai anchorage, East Kalimantan, Indonesia, at a loading rate, each, in excess of 40,000 tonnes per day. With a network of offices around the world, Coeclerici has more than 100 years experience in the sourcing, marketing and transportation of raw materials from mines to energy and steel industries around the world, writes Capt. Giordano Scotto d’Aniello, head of the commercial department at Coeclerici. Founded in Genoa (Italy) in 1895 Coeclerici started operations by importing coal from UK. Over the years, Coeclerici succeeded in consolidating the expertise into mining, shipping, trading of coal and logistics, building up worldwide partnerships and widespread networks in each continent. Committed to continual improvement, Coeclerici adapts itself to the changing needs of its customers and the market conditions of the industries it operates in by investing in state- of-the-art equipment, innovative technology and floating transportation. Known for developing long-term agreements and partnerships with major world producers, Coeclerici also has a strong reputation for investment and has invested directly in the development of certain mines over the years. In 2008 Coeclerici acquired 100% of Korchakol, a steam coal mine based in Siberia near the city of Novokuznetsk; it was the first ever steam coal mine to be bought by a Western company. The acquisition included the production site and transportation system for carrying the raw material to nearby customers as well as a loading centre. One of the strong points of Coeclerici’s logistics division business is that it is market-oriented and focuses on the real customer’s needs. The floating terminals Coeclerici designs, builds and operates for its client, are innovative vessels, built to highest technological and safety standards by the most advanced shipyards in the world. The floating terminals are cost effective alternative to fixed port infrastructures, useful for solving logistical bottlenecks, port restrictions, draught limitations or lack of port facilities. Another significant example is given by the two 53,776 deadweight last-generation transshipment units, Bulk Zambesi and Bulk Limpopo, specifically designed to overcome logistical constraints inherent to the port of Beira (Mozambique), as well as to optimize, from both a commercial and environmental point of view,Vale’s coal handling process from the Moatize mine to worldwide importers. Bulk Kremi in the Black Sea. Viewed as the cornerstone of Coeclerici’s business since its inception, the shipping segment was further strengthened in 2013 via a joint venture with Italian firm d’Amico Group. An important step in Coeclerici’s growth strategy, the partnership has resulted in dACC Maritime Limited, a Dublin-based company that has two 60,000dwt Supramax bulker newbuilds on order, with options for two more, at the world-renowned Oshima Shipyard, Japan. Strongly committed to environment protection and the stringent control of sea and air pollution, both d’Amico and Coeclerici have chosen vessels designed with compartments that recover and treat residual water from cargo holds. In addition, the vessels have class notation ENVIRO, for gas limitations from the combustion, double wall fuel and oil tanks, as well as GP certifications that ensure no environmentally harmful materials were used during the construction. Furthermore, the design will include integral technological upgrades that ensure the units are highly flexible and specialized from both a technical and commercial aspect. The propulsion will include the most up-to-date Man/B&W engine, ME type electronic controlled with low RPM, which will enable speeds of 14.5 knots when combined with cutting-edge solutions to the propeller and hull. This remarkable design will save approximately seven tonnes of fuel on a daily basis when compared to similar modern vessels in operation. Due for delivery in the second half of 2015, the first two vessels will potentially be followed by the two optional ships in 2016. Operating in a challenging market, which rewards firms that invest and adapt, this joint venture of two leading shipping firms is certain to lead to exceptional results as a wide range of shipping expertise and managerial experience knowledge is shared. With a firm belief that correct conduct and true transparency throughout all operations is key to ongoing success, Coeclerici has developed a coveted reputation for excellence over the years. Through continued technological enhancements that provide safe and environmentally friendly transportation, the group ensures full compliance with IMO resolutions, IACS class standards, IOPP/ISPP standards and ISO 9001 requirements for lower dust emissions from coal handling operations. This is made possible through the utilization of products and technology such as closed grabs, water spray systems, duly designed hoppers, wholly enclosed conveyer belts and shorter grab cycles. This commitment to high standards and serving customers with a comprehensive range of quality services is certain to hold Coeclerici in good stead as emission and fuel regulations become increasingly more stringent in the shipping industry. Despite a challenging economy in 2013, the group recorded a turnover of €652 million. With a tradition for continual strengthening of its corporate structure via joint ventures and partnerships as well as ongoing strategic investments in areas of potential growth, Coeclerici has developed a group that is fully capable of prospering in the most challenging global economic markets. TheCat® 834,introduced in the mid-1960s, has set the standard for wheel- dozer design and performance for almost 50 years, ensuring customers optimum productivity, durability and availability through multiple life cycles. The new 834K Coal Scoop builds on the strengths of its predecessors with engine choices that tailor it for use worldwide, a completely new cab, drive- train refinement, new monitoring and diagnostic features, new safety features and structural enhancements. This purpose-built machine is available with ergonomically designed coal scoops to carry (23m3) and doze (46m3) to help achieve top efficiency and productivity while keeping costs down. Rated at 496 net horsepower (370kW), the Cat C18 engine used in the 834K is available in three configurations:Tier 4-Final (Stage IV) using a diesel particulate filter and a selective-catalytic- reduction system to control emissions;Tier 3 equivalent without after-treatment; and Tier 2 equivalent without after-treatment. The C18 uses Caterpillar’s field-tested, mechanically actuated, electronic unit-injection system for precise control of fuel delivery, yielding optimum performance and economy in all operating situations. Fuel-saving enhancements for the 834K Coal Scoop include engine-idle-shutdown and engine-idle kick- down systems, and the delayed-engine-shutdown system protects the engine from hot shut-downs. An on-demand, hydraulically driven cooling fan reduces horsepower draw for increased efficiency. The Cat 4F/3R planetary power-shift transmission used in the 834K Coal Scoop features a new advance productivity electronic control shifting system, which is designed to provide greater machine momentum through shift points, enhancing performance and saving fuel. Forced-flow oil lubricates and cools the transmission’s high-torque clutches to ensure long component life. For increased productivity and precise control, the 834K Coal Scoop’s impeller clutch torque converter (ICTC) allows the operator to adjust rimpull from 100% to 25% in order to match hydraulic effort and rimpull to the operating situation. The ICTC system reduces tire wear and permits full-throttle shifts for greater productivity. The 834K Coal Scoop’s axles feature shaft-mounted, oil- cooled, multiple-disc brakes. The braking system can be equipped with auxiliary oil coolers for added protection. To reduce brake loads, an available automatic retarding system maintains a set downhill speed, minimizing brake use. The 834K Coal Scoop features a completely redesigned operator’s station, with automatic temperature control, new touch-screen display with soft keypad, electro/hydraulic parking brake, and the Cat Comfort III seat with air-ride suspension and integral controls—including the Steering Transmission Integrated Control (STIC) that allows convenient joystick steering. Interior sound levels also are significantly reduced to a quiet 71 dB(A). The 843K Coal Scoop also is equipped with the Cat next- generation Vital Information Management System (VIMSTM 3G), which features a large touch-screen interface and easy-to-use navigation to keep operators informed of the machine’s operating conditions. The system, with data-logging capability, features an Ethernet connection module and an integrated Cat Product Link telematics system, which transmits data to a secure web-based application (VisionLinkTM). Reflecting the solid design of its predecessors, the new 834K Coal Scoop retains its massive full-box-section rear frame that resists torsional shock and twisting forces. Heavy-duty steering cylinder mounts are designed to transfer and effectively dissipate steering loads into the frame. Blade-mounting push beams have a ‘through-width’ design, versus simply being attached to the sides of the frame, a design that dissipates the stress of blade corner- loading into a larger area of the frame. New for the 834K Coal Scoop is a redesigned rear-axle trunnion, now wider and bolted directly to the frame rails, eliminating the previously used intermediate casting and allowing loads to be more effectively dispersed. In addition, the 834K’s lower articulation point (lower hitch) has been strengthened with an increase in front-frame plate thickness and a significant increase in pin diameter in conjunction with a larger bearing. A major design focus of the 834K Coal Scoop is operator safety, and to that end, the new model features a standard rear-view camera, repositioned access ladders, full-perimeter railings and convenient ground-level panel that houses a stairway light switch, engine-shut-down switch and lockouts for the starter and transmission. Available for the 834K is the Cat Detect system, which supplements the rearview camera with radar sensors on the rear of the machine to provide both audible and visual indicators of objects in its working space. The 834K Coal Scoop’s routine service points are accessible from ground level or from large, skid-resistant platforms. Swing- out doors on both sides of the engine give ready access to daily maintenance items, and ecology fluid drains facilitate service and protect the environment. For added convenience, the Electronic Technician diagnostic port and the VIMS service port are conveniently located in the cab’s right console. Blug has been in business since 1965. In that time, the company’s product portfolio has evolved and expanded, giving successful quality-based solutions to different applications and environments. Blug’s target is to offer the highest lifecycle value, high-duty grabs for all type of crane and material requirements. It sees the grab business as a global activity, and offers expertise in engineering and customer-focused developments without any limitation due to grab technology or working conditions. Blug’s products are present in 52 countries and there are more than 3 thousand Blug working grabs in the market (see image 1). handling offers a wide variety of options depending on the crane and capacity requirements. The key factor in obtaining a fast return of investment for this kind of applications is to optimize the grab’s capacity/own weight ratio and offer the highest lifetime versus purchase, start-up and maintenance costs. Credeblug has been continuously adapting and developing its rope-operated product range to improve loading capacity and environmental impact. One of the aspects that have been specially developed during recent years has been the ecologically friendly grab range. Due to pollution that bulk material loading can produce over the environment, Blug products include dust-proof closed valves structure. Blug grabs’ sizing process is specially developed so that the grab weight is minimized. Nominal volume is always defined by the capacity inside the valves/arms but real loading volumes can change from cycle to cycle. Dragging volume is a fixed parameter limited by the grab’s size and geometrical conception, whilst penetration volume can change substantially due to the grab’s working inclination, material compaction or crane operator ability. Blug grabs’ volume definition is always based on dragging volume so that high loading values can be regularly assured, minimizing production non-controllable variables (see image 2). The current market situation demands fast loading- unloading cycles to minimize docking costs. That’s why Blug grabs are always designed giving priority to reducing opening and closing operation times by optimizing the fold reeving system. The application of high strength- and wear-resistant materials makes it possible to reduce the thickness of the structure and pulley blocks without penalizing reliability. Blug’s grabs offer excellent capacity/dead weight ratios: the CM4G- 45000-0,8 clamshell grab with 45m3 capacity and 16 tonnes dead weight is a good example. Energy efficiency: as electric efficiency has become a very important factor in reducing customers’ operating costs and grabs’ environmental impact, Blug’s variable-flow hydraulic systems’ electric requirements have been optimized thanks to its continuous evolution saving 25 tonnes of CO2 emissions per medium-size grab and working year in comparison with fix-flow classic hydraulic system. To improve grab efficiency, the electro-hydraulic Blug range includes Parker-brand variable-flow piston pump-operated hydraulic system. This kind of component adapts and optimizes continuously the grab’s developed power during opening/closing operations. The most important advantage of this system is that the electric demand is reduced more than 40% comparing it with fixed flow hydraulic systems. To control and register variable flow system’s electric demand, Blug has performed different test comparing both systems’ behaviour. These tests results have been controlled by an external certification organism and these are the results obtained with two equivalent grabs operating with different hydraulic units working on same 8m3 grab structure (see image 3). Design for impact protection: Blug regularly develops detailed impact simulation for critical elements that are normally exposed to impacts. These areas are reinforced so that stress transmission can be dispersed over the structure without mayor damage and low weight increase. The company’s patented rib reinforcing and inner body oil circulation tubular systems are good examples that offer a longer lifetime for critic components and minimize non- programmed maintenance actions. Incoming deliveries are related with biomass, mineral and cereal handling as well as scrap handling grabs. Blug has recently been awarded a contract for the supply of three urban waste handling grabs for western Asia and two 10m3 bulk handling clamshell grabs for the Spanish market. One of Turkey s largest service providers in heavy transportation and the handling of bulk material — especially in ports — is the company Aydinvinc. Aydinvinc, a family-owned company, specializes in heavy hauling and material handling in the ports of Bursa, Gebze and Bandirma. The company is heavily involved in the handling of bulk goods in the harbour areas. One of the largest trading centres for Aydinvinc is the Port of Gebze in the area of Kocaeli. Here, Aydinvinc handles all bulk goods like coal, sand, gravel, grain up to scrap and raw materials. The modernization of the port facilities, in response to growing bulk handling on the quay, has made it necessary to provide shorter turnaround times during loading and unloading of materials. For this task, the Terex Fuchs Dealer Yuraterex, located in the area of Istanbul, provided the most efficient and appropriate machine solution. ‘Versatile, highly stress-resistant and suitable for large handling capacities in port operations’ were the requirements of Aydinvinc for its new material handling machine. In close co-operation with the customer, the dealer Yuraterex and the Terex Fuchs Application Center, an individual powerhouse has been configured. Electro-hydraulic drive conception, 7m height to the substructure and a crawler chassis were assembled on a Terex Fuchs RHL880D XL-trac. With an optimum power dissipation through the pyramid-shaped undercarriage in the extra wide tracks, this 96-tonne machine can move large loads quickly at 22m radius on unpaved surfaces. With 12m viewing height, the machine ensures the best view from the operator in the cargo hold of various vessels. Especially in coal handling, it is important to maintain effective ways to use the right equipment. Vessels must be cleared quickly and it is important to ensure the flow of materials for further processing. The RHL880D XL-trac is an effective and efficient solution to handle materials in record time. With up to 600 tonnes of coal and an consumption average of 80kW per hour, this machine has proved to be a reliable and efficient workhorse at Aydinvinc. Unlike conventional devices, such as cable cranes, the RHL880D XL-trac is ready for immediate use and can be driven to different locations thanks to the 70m cable-reel on the undercarriage. With the powerful and precise hydraulic control system, heavy loads like steel-coils can be loaded exactly. In Gebze, up to 5mt (million tonnes) of bulk cargo are handled every year. With its rapid loading cycles and high load carrying capacities, the RHL880D XL-trac plays a crucial role in the success of the port operators and thus for Aydinvinc. Coal handling is a tough business and customers expect solutions which are able to meet the demands of this rugged environment. Conductix- Wampfler, part of the Delachaux Group, knows what it takes to withstand the rigours of this market, after all it has been in it since 1902. The company specializes in the design and manufacture of power, data and media transfer systems for mobile applications and produces the broadest range of solutions available from any single supplier in the market. Active on every continent, the company has Centres of Excellence, responsible for production, R&D, engineering and central support functions located in Germany, France, USA and Italy, with dedicated production centres in Ireland, India, UK, China, Australia and Brazil. So if it’s a cable reeling drum for stacker in South America or a energy guiding chain for a crane in China, Conductix-Wampfler has the solution. Conductix-Wampfler knows coal handling, which comes under its Mining & Bulk Material Handling focus market. A team of highly experienced experts in the field of stockyard and bulk transport applications deal with hundreds of requests for solutions per year. Working closely with the dedicated Global Market and Application Support team and the teams at the Global Centres of Excellence, Conductix-Wampfler is at the forefront of the supply of hard-working, long lasting, heavy duty solutions in this market. The company provides an impressive choice of solutions designed to accommodate the full range of movements required by today’s heavy duty coal handling equipment, supplying solutions for stacker and reclaimers, stockyard cranes, shiploaders/unloaders, car dumpers and tripper conveyors. Handling the robust, heavy cables and hoses required for modern coal handling systems is no problem to the Conductix-Wampfler range of motor driven and spring cable reels, heavy duty festoons and energy guiding chains. Long/gantry travel can be accommodated by a range of solutions, from large level wind reels handling over 2,000m of cable, through monospiral, 3-2-3 and random winding drums for shorter run lengths. When combined with the Conductix-Wampfler fibre optic rotary joint, the systems are able to utilize combined power and fibre optic cables, which have the ability to transfer large amounts of data quickly and efficiently. Conductix-Wampfler produces reels with a wide range of powering options, from the company’s patented MAG Drive magnetic coupler, through torque motor, hydraulic and variable frequency drive systems. The reels can be supplied with an impressive range of slip ring and fluid rotary joints, able to handle voltages up to 36kV and pressures of over 400 bar. Cables and hoses are sourced from premium suppliers, with many of them made to Conductix-Wampfler’s own design. For shorter run lengths and slewing motions with multiple cable/hose requirements, Conductix-Wampfler produces a range of heavy duty I-beam festoon systems and energy guiding chains. The festoon systems are configurable to accommodate a wide range of I-beam dimensions with either parallel or tapered flanges and designed to fit existing installations or according to the customer’s wishes. The components are hot dip galvanized as standard, but are available in stainless steel for especially harsh environments. All come with stainless steel fasteners as standard. Where infinite rotation is required, Conductix-Wampfler can supply slip rings and fluidic rotary joints. With Ingress Protection up to IP67 and with ATEX 21 and 22 certifications available, the units are able to handle most of the environmental requirements seen in the coal handling world. Coal handling equipment demands robust solutions, providing high machine availability and low maintenance; the Conductix- Wampfler range fits the bill, being designed and built to withstand the aggressive environment of dust, water, salt and high/low temperatures common in this market. The Asian market is vital to all producers, transporters and users of coal and this is no exception for Conductix-Wampfler. Its sales and marketing organization in China is growing with the demand for international products in this region. In the last three months, Conductix-Wampfler has been awarded contracts with some major Chinese players in the coal handling market. Baosteel has accepted offers for MAG Drive cable reeling drums for a stacker/reclaimer at its Majishan works and for two drum reclaimers and four stacker/reclaimers at its Zhanjiang operation. Power stations also demand 24/7 solutions and the renowned Conductix-Wampfler MAG Drive technology has also been selected at Baiyin and Shanxi power plants for use on their hard- working stacker/reclaimers. Wherever bulk material — including coal — is handled, Sandvik Mining is present. In addition to meeting the needs of the mining industry, the company also excels in meeting the needs of downstream operations, such as power plants and mills, ports and terminals with an approach tailored for each application. Reclamation, stockyard storing, sizing, homogenization and transportation are all materials handling processes Sandvik supports. The offering for turnkey projects, individual new equipment or upgrades and modernizations includes consulting, systems design, engineering, procurement, erection and support. Sandvik applies materials handling and automation technologies to help customers best utilize their assets. Additionally Sandvik designs and manufactures a full range of conveyor components like idlers, pulleys, belt cleaners, etc. used in materials handling equipment, whether for new systems or replacement parts for any existing system. The goal is to make the customers more successful through long-term cooperation and partnerships; success comes from efficient process design, innovative engineering and a dedication to reliability. Through the well developed Sandvik Mining organization, global parts logistics and local services keep the continuous materials handling processes running. Sandvik Mining’s Materials Handling business offers all services related to bulk materials handling, including feasibility studies, conceptual plant layouts, design, engineering, and the entire execution of complete systems to handle coal, ore, bauxite and other different materials — a vast range of equipment for applications such as the following: v conveying, stacking, reclaiming and blending of bulk materials; v loading bulk materials into ships; v unloading bulk materials from ships; and v crushing, sizing and feeding of bulk materials. All around the world, sea-going and coastal vessels are constantly being loaded or unloaded with different bulk materials. In order to ensure a thriving international sea trade, to load the material at the export terminal and unload the vessels in the import terminal, to store the material at the ports continuously and in a very short time, a high standard of perfection in port-handling methods is needed — an area where Sandvik has a vast experience. The equipment can be supplied with various modes of operation, including manual operation by onboard operators, semi-automated and fully- automated operation integrated in a central, remote control system. Sandvik linear gantry and quadrant bridge type shiploaders are constructed in proven, eco- friendly designs with a wide range of sizes to service vessels from 5,000dwt to 250,000dwt. Central to the Sandvik philosophy is minimal disruption of the port during installation of the shiploader and its supporting equipment. Sandvik’s process for off-site construction, assembly, testing, commissioning and heavy-load transportation is highly advanced, resulting in installation of fully operational shiploaders with capacities up to 20,000tph in just a few days. The range includes a variety of shiploaders which provide travelling, telescopic functions, luffing and/or slewing installed onto longitudinal jetties, or radial shiploaders which incorporate a fixed pivot point. SHIP UNLOADERS (PU SERIES) Sandvik ship unloaders of the linear gantry and level-luffing types are constructed in proven designs and a wide range of sizes to service vessels from 5,000dwt to 250,000dwt. Focusing on grab technology, they offer efficient, rational solutions to demands for quayside flexibility and are the perfect rigs for unloading materials with different bulk densities. Sandvik’s product portfolio of standard equipment for bulk materials handling applications covers HC-series belt conveyors and HF-series belt feeders, both having fixed and mobile units. With a wide range of standard modules and components these devices can be tailored exactly to meet the needs of the application. The advantages of the mobile equipment make them ideal and cost-effective in conveying and stockpiling materials. Sandvik stackers effectively stockpile bulk materials in an efficient and orderly manner. Stationary or travelling, borne on rails or crawlers, they can be supplied in fixed, luffable or luffable-and- slewable boom designs, with capacities from 150tph to 20,000tph. The choice of design depends on factors such as the stacking method and size of the stockpile, the type of material, the required throughput and the demand for mobility. Tripper cars or tripper systems for transferring material from the yard conveyor to the stacker are considered part of the stacker. Sandvik reclaimers are designed to reclaim bulk materials from stockpiles at mines, ports, steel plants, power stations, etc. in a quick, efficient and orderly way. They are available in several main types, including bucketwheel, scraper and drum-type reclaimers, and in many configurations and sizes, with capacities from 500tph to 20,000tph and more. The choice of design depends on factors such as the size and shape of the stockpile, the type of material to be reclaimed, the required reclaiming rate and the need for blending or homogenization. end of the ring and reclaim the material simultaneously from the other end. TRANSPORTATION SYSTEMS (PC SERIES) Sandvik has a highly skilled projects division specializing in the design, manufacture, installation and commissioning of conveyor systems for a full range of applications. The company also upgrades and modernizes systems and supply a comprehensive range of its own quality components and spare parts. The core business of RC Inspection is to provide an independent, fast and reliable sampling and analytical services with a direct people-to-people approach. The offices of RC Inspection are strategically based around the globe meaning that it can offer its services at short notice and giving excellent turnaround times to its customers, acting as a true partner in business. The company can offer the highest levels of expertise for both physical sampling, inspection and analytical services in the fields of bulk ferro alloys and noble alloys (high purity/rare earth/minor) metals, minerals, ores, scrap materials and all kind of solid fuels. RC Inspection solid fuels department performs inspection and analysis for different products. Its services are mainly performed on several sources of steam coal, coking coal, PCI coal (pulverized coal injection), metallurgical coke, pet coke (petroleum coke) and anthracite of various origins. RC Inspection performs extended service list in Europe like The Netherlands, Belgium, Germany and Ukraine as well in Turkey, Russia, South Africa, Mozambique, China, Hong Kong, United States, Colombia and Indonesia. The company has adopted a successful business strategy and excels in terms of expertise and the technologies it uses. It believes in training and guidance of both its surveyors and its office staff to be sure that the working quality is ensured. Surveyors and office staff of RC Inspection have been educated internally by senior coal technicians, so that it can guarantee that the cargo-interest will be protected in a most representative way. In the past few years, this strategy has paid off and the company has grown and now has successful offices strategically based around the globe. All of the company’s surveyors are fully equipped with state of the art means of communication to perform to perfection. The sampling is performed with ISO stipulated equipment. The equipment handed out to its surveyors consist of the basic safety equipment and additionally the ISO shovels in various sizes to conduct the sampling according to standards, digital photo- camera, temperature-control Infra-red equipment as well the conventional equipment for temperature-control of stockpiles. The new requirements, set out by BAM (Bundesanstalt für Materialforschung und -prüfung), the German Institute for Materials Research and Testing, will be followed by RC Inspection. The company will also provide technical services and temperature control to avoid any problems during the transportation of coal cargoes into Europe. For the cargo range of coal, cokes, petcoke and anthracite, RC Inspection is leading the way in deep temperature control and infrared temperature control. RC Inspection has the equipment and the expertise to perform deep temperature control and infrared temperature control on incoming cargoes prior to discharge operations, during discharge operations as well during the period of stockpiling and re-loading operations ex-stockpile to protect the cargo and avoid any spontaneous combustion. RC Inspection carries out services for many national and international clients, international trading houses and coal consumers such as coal-fired power-stations. The company’s client base is spread around the globe, so it can deal efficiently with different customers and time zones. Its office staff also work outside office opening times and during the weekend to make sure all is under control and clients are constantly updated. RC Inspection prides itself on this personal service, which ensures that its customers are happy with its work. The ever increasing technical demands in the bulk materials industry are reflected in the expectations of the user. Manufacturers who not only supply everything from one source but also undertake the complete project to the point of turnkey handover are in demand. The Beckum, Germany-based BEUMER Group with affiliations around the globe develops customized system solutions for conveying and loading, palletizing and packaging, and sortation and distribution systems. BEUMER also acts as the main contractor on behalf of its customers. “A significant trend is that more and more clients want to commission their systems in a turnkey state,” says Dr. Gerd Oberheuser, head of system technology at the BEUMER Group, regarding the increased market requirements. EPC (engineering, procurement & construction) or EPCM (engineering, procurement & construction management) are the buzzwords here. EPCM is an enhanced form of project management. “This trend can be seen in many parts of the bulk materials industry, for example in cement and opencast mining,” explains Oberheuser. COMPREHENSIVE PORTFOLIO FOR THE BULK MATERIALS INDUSTRY With the acquisition of Enexco Teknologies India Limited in 2011, the BEUMER Group has expanded its business activities in India and in doing so has strengthened its presence, particularly in the cement industry, in one of the world’s most important growth markets. For example, the portfolio includes horizontal and vertical belt conveyor systems, belt bucket elevators, heavy-duty bucket elevators for particularly large delivery rates and heights, and steel cell conveyors fitted with chains or belts for clinker. The intralogistics specialist also provides grinding mills, silos and systems for filling, palletizing, packaging and loading. “For a quotation to be accepted, contracts are often only placed on an EPC basis,” remarks Oberheuser. This means that, as well as supplying the equipment, BEUMER is responsible for the whole process. This includes the design of the entire system, the installation, the commissioning and the instruction of subcontractors. Not only does a high availability of machines and systems play a decisive role, but also optimum support. For this reason, BEUMER has set up competence centres in the Czech Republic, in Austria, at its headquarters in Beckum, and in North America. These take care of research and development, sales, project management and purchasing. With its solutions, the BEUMER Group helps users to work more cost effectively and in a more environmentally friendly manner. BEUMER belt conveyors enable companies to transport large quantities of bulk material from the quarry or mine to the factory or port as cost effectively and as quickly as possible. Trucks have considerable disadvantages in this regard. Road building is expensive, and the more raw materials have to be transported from the excavation point to the factory, the more journeys have to be made. Added to this are the operating costs and emissions caused by trucks — both with regard to fuel consumption and personnel costs as well as noise and dust. As a result of the direct route, the material is transported much faster than by truck. In addition, belt conveyors can be operated with significantly fewer personnel. Another aspect compared with trucks is the lower energy consumption, which at the same time reduces CO2 emissions. Depending on the project, belt conveying systems need up to 90% less primary energy than comparable truck transportation. Belt conveyors can overcome long distances, steep gradients and tight curves, and can be individually matched to the particular task and topography. Use is made of durable, tension-resistant conveyor belts. In doing so, BEUMER uses various calculation programmes to determine the optimum belt design. These enable tensile forces to be analysed and also forces which occur due to acceleration and deceleration — always taking into account the intrinsic weight of the belt and the transported material. They are also used to determine possible curve radii. BEUMER also provides advance feasibility studies. In addition, the belt position is calculated in advance with the appropriate curve radius for the empty and loaded states. With their slender lines, belt conveyors overcome broken terrain and other obstacles such as rivers, roads, buildings or rail tracks. Horizontal and vertical curves in the routing can also be overlapped. Depending on the requirement, BEUMER offers open troughed belt conveyors for higher throughputs and larger mass flows as well as larger curve radii, and enclosed pipe conveyors for products which need to be protected against the effects of the environment. At the port of Callao in Peru, BEUMER will be installing pipe conveyors with a length of around three kilometres for transporting copper, lead and zinc concentrates for completion in 2014. “Depending on the landscape and environmental conditions, we can install overland conveyors with horizontal curves with lengths of up to 20 kilometers,” explains Oberheuser. Gradients of up to 15° can be realized depending on the characteristics of the materials to be conveyed. After planning, installation and commissioning, maintenance and service are no more laborious than with a straight conveyor. On average, the annual maintenance costs are only around 2% of the investment sum. In Canada, BEUMER is currently installing a conveyor with a length of 3.48km for a large mining concern. This will convey up to 6,000 tonnes of iron ore per hour. This large- area conveyor system must withstand extreme temperatures of down to –40° and heavy snowfalls. BEUMER has designed all mechanical and structural elements for the extremely low temperatures. For example, the system is fitted with a feed conveyor and an unloading system with tripper car. As main contractor, BEUMER is equipping a new distribution centre off the shore of Malaysia with 17 trough belt conveyors with a total length of 12km for a large iron ore exporter. The conveyors will ensure swift transport of iron ore from super-size freighters to the mainland. BEUMER will deliver and install the conveyors, put them into operation and take full charge of engineering, all according to a strict timetable. Worldwide, coal and petroleum coke fuel power generation — Geometrica has built many facilities to store these materials under cover and help industry protect the environment, writes Melanie Saxton of Geometrica. This paper presents a few examples from the US,Tunisia,Taiwan, Indonesia and Mexico. Around the globe, Freedome® technology allows the building of stockpile covers regardless of terrain or weather conditions. The JEA Northside Generating Station uses coal and petroleum coke, in combination with oil and natural gas, in three large steam units and four small diesel-powered peaking units to produce more than 1,300MW of peak electric capacity. Two online 300MW, circulating fluidized-bed (CFB) combustors serve customers in Northeast Florida, which is also home to US Navy bases and a major port. Geometrica provided the circular coal storage domes spanning 122m to shelter the plant’s fuel supplies of coal and petroleum coke. The innovative interior cladding of the space frame structures was developed to provide safer fuel storage. This Freedome® technology was an instrumental part of JEA’s successful repowering strategy for converting two ageing oil/gas- fired steam plants to also burn solid fuels. As the eighth-largest municipal utility and clean-coal powerplant in the United States, JEA provides less costly, cleaner and more efficient electric, water, and wastewater services. The plant received the prestigious 2002 Powerplant Award for outstanding achievement in the development of a successful repowering strategy that increased efficiency while reducing both emissions and the cost of electricity. To complete the project, FLSmidth supplied machinery and engineering. Turkish contractor, EKON, was FLSmidth’s partner for civil work which compares in scale to that required to build an entire town. The plant began to take shape in late 2010 and was completed in 2013. Designed to produce 5,800 tonnes per day of cement, it is now Tunisia’s largest and most technologically advanced cement plant. As part of its expansion plans,Tai Power needed covered fuel storage at its Hsin-Ta Fossil Power Station in Kaohsiung Hsien, Taiwan. The state-owned company retained Gibsin Engineers to draw up the plans and specifications, including four 126m diameter concrete silos with internal automated stacker/reclaimer system and metal dome covers. Each unit would store 180,000 tonnes of coal in a live pile, providing a total capacity of 720,000 tonnes. The metal dome covers presented several challenges, from saltwater spray to recurring typhoon winds, and would have to be built after the coal stacking/reclaiming equipment was installed. Specifically, it would have to be designed to minimize accumulation of coal dust on the structural members to prevent fire and explosion hazards. Geometrica fabricated 37,000 nodes and 120,000 galvanized steel tubes, plus assorted purlins, hardware and accessories for each structure at a facility in Kaohsiung. Construction began July 2006 using the ‘perimeter-in’ method. Turnover of the domes and testing of the first silo started in October 2007, and attests to Taiwan Power’s commitment to a clean and safe environment. After carefully considering the fluctuations of the natural-gas market in recent years, Pupuk Kaltim launched a project to diversify its fuel with a new coal boiler at its Bontang, East Kalimantan facility. Environmental impact was a concern, and Pupuk Kaltim chose to use only clean-coal technologies including a circulating fluidized-bed boiler, a Geometrica coal-storage dome and a continuous barge unloader. These technologies are used at a previous Geometrica project, the JEA Northside power plant in Jacksonville, Florida, to help keep the environment around the facility pristine. Mr. Supriono, a mechanical engineer with Pupuk Kaltim, made the initial contact with Geometrica in 2009. The dome was to be supported by a 10-metre-high, reinforced- concrete, perimeter-ring wall and would cover 40,000 tonnes of coal, plus a coal stacker and a portal reclaimer. Specifications were challenging. The dome not only had to resist the specified environmental loads, withstand corrosive attack from the humid Kalimantan environment and help control explosion hazards, but also use technology that permitted fast construction by local crews and without special equipment. As a supplier of bulk storage applications, Geometrica is devoted to helping plants, mines and waste management facilities achieve the optimum and most economical solution for protecting their stockpile materials from the elements. Mexico is no exception. Geometrica supplied 70m circular coal storage domes for Cementos Moctezuma’s Cerritos and Tepetzingo plants. The design called for conical stockpiles built by dropping the material from the dome’s apex. This stacking method is subject to generating dust inside the dome, therefore these units also feature Geometrica’s internal cladding, preventing the fuel from creating a hazard by accumulating on internal structural members. Polyester powdercoat on the exposed structure adds an architectural touch to these beautiful and advanced cement production facilities. These are some examples of Geometrica’s many storage solutions for power generation around the world. Custom CAD software enables Geometrica to design and generate geometries exactly suited to a project’s requirements. And the inherent economy of the dome shape conserves materials and eliminates wasted space, making it an ideal bulk storage solution for coal storage. Coal is one of the most important energy sources in the world. The use of modern technology to reduce the impact on the environment of the coal power plants is very important today, as is the use of more efficient and economical methods of storing coal. Combining the latest available stacking and reclaiming technology for coal storage at power plants is a great advantage that Bedeschi can offer as described in the following case studies. This project is of turnkey design, as it includes the engineering, construction, complete supply of materials, commissioning and starting up of the equipment to develop the 2,640MW plant. South Brindisi is one of the biggest coal-fired power plants in the country. It is operated by ENEL Produzione S.p.a. The power plant will use coal sourced from Indonesia and South Africa. The project takes into account environmental concerns and will aim to take the place of the current outdoor longitudinal coal storage at the power plant. This will involve the implementation of two new domes with a wooden covering structure and an environmental impact almost equal to zero. The dome’s dimensions will be as follows: diameter 150m, height 45m, total stored volume of coal 350,000 tonnes. The use of circular technology in the stacking and reclaiming operation will also see an increase in efficiency. The contract placed with Bedeschi, which started in August 2011, includes the supply of all the mechanical components and the electrical and control systems for two STK R 35/2000 circular stackers and two PAL PRD 300/36+240/24 double arm slewing lateral portal reclaimers for coal handling at the power plant. These mechanical components and electrical and control systems will be installed into the complete automation of stacking and reclaiming operation. The stackers have been designed for 3,000tph (tonnes per hour) and the reclaimers have been designed for 1,500tph. The project is unique because the two machines will be equipped with state-of-the-art safety and environmental systems. The project uses various new technologies. The machines will be equipped with a vacuum cleaning system for standard maintenance operations, a water spray system for dust suppression and de-dusting operations, an air compressed system and also, due to highly restrictive classification of the hazardous area (ATEX 22.2), two firefighting systems. A gas firefighting system will be located in the power and control cabins, while a high pressure water firefighting system will be installed in the machine column to prevent and fight any fire that may occur on the heap surface of the stored coal or on the belt conveyors onboard the machines. In December 2013, Bedeschi started the erection phase of the first dome. The entire project will be completed by the end of 2015. Tirreno Power is planning to improve the coal handling facilities in the Vado Ligure site. The design phase requires developing the coal handling system from the storage area to the unit charging bunkers in order to allow proper execution of operations, as well as to increase the indoor reliability of the whole coal conveying system. The stockyard will be covered by a structure and the machines requested have to be designed according to the capacity requested and the dimensions of the shed. The supply consists of a turnkey plant equipped with two longitudinal double boom reclaimers, one rotating stacker and two belt conveyors. The equipment will respect the ATEX norms. For safety, a firefighting system is in place to signal and stop fire with inert gas inside the power cabins on board of the machines. 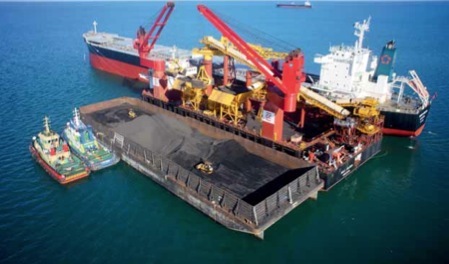 The Floating terminal devised by Bedeschi, Liebherr and Logmarin, Princesse Chloe, began coal transshipment operations in 2011 in Indonesia, at the Maura Pantai anchorage in the Sulawesi Sea (East Kalimantan) for PT Berau Coal. The daily designed loading rate is 50,000 tonnes, which amounts to over 800,000 tonnes per month. the hoppers on variable-speed belt feeders, and then fed to a conveyor system which leads to the ship-loader. Transfer points are designed to ensure that no blockage occurs and that the material flows smoothly. All conveyors are enclosed to avoid airborne pollution. Double independent generator sets are installed on the vessel, ensuring 24 hour a day non-stop operations and 100% redundancy. Princesse Chloe is capable of loading large vessels up to Capesize. It is designed for maximum coal transportation. Fuel consumption is very low, making the whole system more efficient. In 2011, Princesse Chloe loaded 41 vessels between Panamax and Capesize, achieving an average daily loading rate up to about 47,000 tonnes of coal and achieving a best performance rate of over 56,000 tonnes. Bedeschi is a leading supplier of machinery and services to bulk material handling and minerals industries, focused on handling difficult materials from sticky coal or clay to dry and wearing iron ore and minerals. Bedeschi’s wide set of products include: bucket wheel, lateral, portal or frontal bridge, semi portal and quarry reclaimers, stackers, longitudinal, circular and vertical wall blending storages, belt conveyors, crushers and air/gas cleaning systems. The choice of the best machines to be selected depends on several factors including the type of coal handled and requirements for blending. Bedeschi’s technical department is available to assist users and recommend the most appropriate technical and commercial solution. In today’s economic environment, companies that want to be competitive, innovative and perform successfully need to do more than simply offer standard solutions to their customers. They need to adapt their thinking to meet modern-day needs and satisfy the particular demands of their customers. Globalized economics leads also to new challenges: major projects, big efforts and environmental protection. Bedeschi has recently entered into a contract for the development of Vanino Port, on the east coast of Russia. The deepwater coal handling facility will form an integral part of a $6.7 billion federal project to enhance the capacity of the Elegest coal mines located in the centre of the Tuva Republic near Kyzyl. The ambitious project, being undertaken by Russian firm Tuva Energy Industrial Corporation (TEIC) LLC, includes the construction of a 400km railroad connecting the mine to the region’s main commercial hubs and the new port terminal in Vanino. As a result of the integrated mining, railway and port project, it will be possible to export about 15 million tonnes of coking coal annually. Bedeschi has been selected for the complete port development project amidst tough international competition during the bidding process. Bedeschi’s scope of work can be broadly divided into three parts: receiving coal; storage & retrieval of coal; and shiploading. Coal will be transported from mines located more than 4,500km away by open top wagon cars. Each train will carry 6,000tonnesofcoal. Theportwillhaverailwaysidingto receive and unload two rails of 95 rail cars simultaneously. The 3,200tph (tonnes per hour) unloading facilities will include positioning devices capable of handling 95 rail cars at a time. The cars will be unloaded by using wagon tipplers. Bedeschi will supply the new port with a double tippler station, capable of rotating four 100-tonne wagons with a total capacity of around 6,000tph. The overall positioning and unloading time of each car will be only 145 seconds in total. Coal will be collected in large hoppers, into which the cars will be unloaded, and through a series of feeder belts and conveyors will be transported to the stacking area where two automatic stackers will distribute coal in segregated piles at 3,000tph each. The total stock capacity at the port will be about 600,000 tonnes. The retrieval of coal from the storage will be done by means of two bucketwheel reclaimers at 4,750tph. These will be feeding from a conveying system leading to a jetty equipped with two shiploaders of 4,750tph capacity each. The shiploaders and the jetty will be able to load vessels up to 120,000dwt capacity. Engineering activities of this project is presently going on and the scheduled deliveries of the equipment are in 2015. This prestigious project is a culmination of the advancements made by Bedeschi in the marine sector where Bedeschi has implemented various port and offshore logistics projects. Vanino Port will serve the coking, coking coal concentrate and energy coals for international markets including Korea, China and as far away as Western Europe, and will be capable of handling two 120,000dwt vessels simultaneously. The strong partnership of Bedeschi, Liebherr and Logmarin together can offer integrated services leading to successful project implementation and whenever the client requires (BLL) provides comprehensive advice and technically sound products. Much of the world’s coal handling and storage equipment was placed in service many years ago, with little consideration given during design to the flow properties of the coal. Moreover, many facilities that have operated relatively trouble-free for many years are switching fuel sources to low-sulphur sub-bituminous and/or PBR (Powder River Basin) coals. Failure to consider the flow properties of these new coals can cause more than just headaches. In addition to issues with coal flow stoppages and poorly designed transfer points, many of our Jenike & Johanson’s clients approach the company after catastrophic fire or explosion events have occurred in their facilities. The problem is often a funnel flow discharge pattern of the coal in the client’s bunkers, resulting in significant pockets of stagnant coal. Coal will self heat when stored at rest and under pressure, and in the worst cases, will catch fire and or explode. The solution to these coal fires and explosions is often conversion to a mass flow pattern, which eliminates stagnant pockets of coal. With mass flow, all of the material is in motion while the storage vessel is discharged, which provides a uniform residence time for all the coal. The opportunity for stagnant coal to self heat is eliminated, thus eliminating coal storage fires. To engineer solutions to convert bunkers from mass flow to storage flow, Jenike & Johanson’s clients send coal samples to its lab for flow properties tests, using the widely accepted Jenike Shear Tester. With cohesive strength and wall friction data learned from testing, the company’s engineers are able to recommend hopper modifications to provide mass flow for most existing bunkers. Modifications are always case specific, but may include a combination of revised hopper geometry, a low friction hopper liner, a revised feeder arrangement, or a bin insert (or Binsert®). Jenike & Johanson’s clients typically report that not only are coal fires eliminated by its engineered solutions, but they often report significant gains in live capacity in their modified bunkers due to the elimination of stagnant regions that previously did not discharge. Coal fires aren’t the only problems that Jenike & Johanson can solve. The following highlights some of the different challenges the company helps solve in the coal industry. Poor material flow in the coal industry will yield electrical generation losses, throughput limitations, non-uniform processing, dust emissions/spillage, bunker fires, and even equipment failure. These problems require frequent operator intervention and increase maintenance costs. A significant amount of equipment designed decades ago to receive, convey, crush and pulverize traditional fossil fuels is no longer suitable for handling low- sulphur coal. Below is a sampling of clients for which Jenike & Johanson has successfully provided bulk material engineering services for in the energy and power industries. hopper analysis and design; and v	optimization of chutes and belt configurations to minimize spillage, dust, and wear. Whether reclaiming from a stockpile, feeding biomass for co-firing with a fossil fuel, or conveying waste streams to storage silos, Jenike & Johanson can help achieve reliable material flow and transport at coal handling facilities.